After being here in St. Louis for about 3 weeks now, I'm finally beginning to feel more at home. Even though I grew up in STL, our new place is about 25 minutes north of my parents' house, and it's an adjustment from the big city living we had in downtown Chicago. It's so quiet here! Initially we had a hard time getting to sleep without the 'sounds of the city' - sirens, arguments, gun shots (j/k . . . kind of . . .). I started my new job last week, and it's an adjustment as well. It's never easy to start at a new place and to learn new things that take me out of my comfort zone. One downfall is that, aside from a few quick glances at Google Reader, I can no longer read cooking blogs at work . . . at least for the next couple of months. I probably should have never done that at my old job though! Getting back in the swing of cooking is difficult as well. By the time I get home from work, I'm exhausted! Bob was a good house-husband last week and made dinner every night. This week, I'm making more of an effort. My mother-in-law sent me Trisha Yearwood's cookbook "Home Cooking" as a surprise after seeing her on "The View." I love to get surprises in the mail :) There are a ton of great-looking recipes in this book - nothing fussy or complicated, just good, crowd-pleasing food. Although it's summer and the temps here in St. Louis are in the '90's, I couldn't resist making this Fancy Chili, mainly because Trisha serves it over rice, and it's actually not much like chili at all. There's very little liquid, and it consists of a hearty yet healthy meal filled with veggies. I'm sure you can add a number of vegetables to the dish. I omitted the beans because I always do, and I used ground turkey of course. This was a fantastic dinner! You certainly don't have to serve this over rice, but I really liked it that way. The sour cream topping and fresh, sliced green onions on top added to the flavor and texture. I can't wait to take the leftovers to work for lunch! 1. In a large saucepan, heat the oil over medium heat. Add the garlic and green onions, and cook for about 1 minute. 2. Add the ground meat and cook until browned, about 5 minutes. 3. Stir in the chili powder until fully combined. 4. Add the tomatoes, beans, bell pepper, carrots, brown sugar, and salt. Bring the mixture to a boil, then reduce the heat to low. 5. Cover and simmer the chili for 15 minutes. 6. Adjust salt if necessary, and serve over white rice with a dollop of sour cream and garnish of sliced green onions. My husband is on a chili kick and has made turkey chili two weeks in a row! I DO eat RICE w/ my chili. Its probably a regional thing-I grew up in the rice fields of East Texas. My husband, who grew up an 1 1/2 hrs. west of Houston NEVER had rice w/ chili! I can't fathom eating it any other way! Is Bob a house-husband now? NO FAIR!!! Just wanted to say I'm glad you're liking STL and adjusting :) I love it here (and my family is actually from a suburb of Chicago), but these crazy hot days take some getting used to! 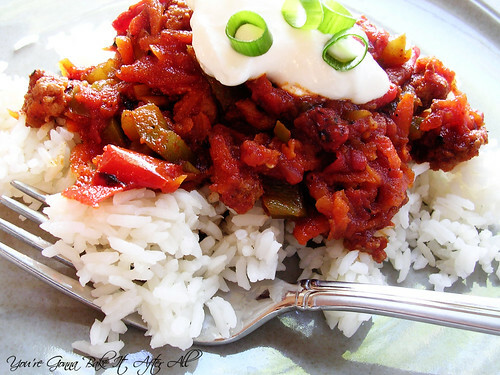 Glad you're settling in :) Your chili looks so flavorful - I'd make it in hot weather too!